Ogoni heartlands have been subject to ruthless natural resource exploitation and environmental degradation. Part of the ongoing reconciliation between the Ogoni, the Nigerian authorities and the private sector actors including Shell Oil was an agreement to conduct a thorough clean-up of the polluted lands in Ogoniland from numerous oil spills and industrial waste. However, the progress of clean-up programme has been heavily criticised by MOSOP leadership, despite President Mohammed Burari assuring Ogonilanders otherwise. 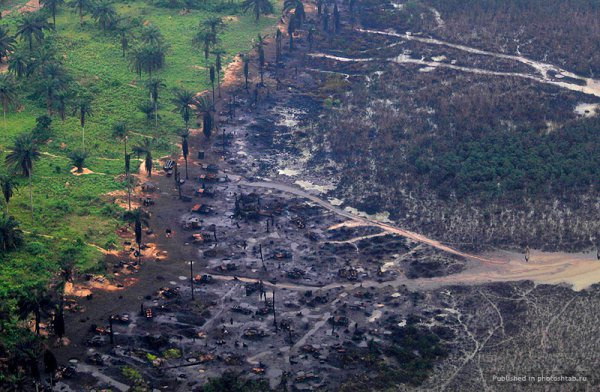 Movement for the Survival of Ogoni People, MOSOP, and Social Action, SA, have informed President Muhammadu Buhari that the clean-up of the devastated Ogoniland was not progressing satisfactorily as he claimed. MOSOP and the civil society oganisation stated this yesterday in Port Harcourt, Rivers State, during a quarterly engagement with CSOs coalition and communities to review progress on the Ogoni clean-up and emergency measures organised by the Civil Society Legislative Advocacy Centre, CISLAC. However, Conflict Advisor of CISLAC, Salaudeen Hashim, in his opening remark said that the essence of the meeting was to appraise the entire process of the clean-up and to ascertain what has worked and things that have failed. Meanwhile, spokesman of MOSOP, Fegalo Nsuke, said the Federal Government was not correct, noting, “I totally disagree with the President because I don’t think that if the project is moving progressively, the Ogoni people will still be drinking polluted water.